Jaya was planning for pilgrimage to Dwarka, but it was getting deferred. We planned this time for our visit to Dwarka. Located on the west coast of Gujarat, Dwarka is known as Lord Krishna’s abode. Dwarka, the holy land surrounded with the legends of Lord Krishna, is a significant pilgrimage site for the Hindus. The city lies in the westernmost part of India. Dwaraka (also known as Dvaravati, both names meaning “the many-gated city” in Sanskrit. Dwarka is one of the foremost Chardhams, four sacred Hindu pilgrimage sites, and is one of the Sapta Puri, the seven most ancient religious cities in the country. It was also a port-city, having trade relations with many sea-faring nations. The Garuḍa Purāṇa enumerates seven cities as giver of Moksha (Salvation). Dwaraka is said to be one of the seven most holy Hindu places (Kṣetra) in India, with Varanasi usually considered the holiest. A Kṣetra is a sacred ground, a field of active power, a place where Moksha, final release can be obtained. We reached Jamnagar by air from Mumbai by Air India flight. We reached Mumbai from Ranchi last evening by Indigo. We stayed in Hotel Orchid near Mumbai airport. We preferred this hotel for convenience and proximity to the airport. From Jamnagar airport, we drove down to Dwarka. On the route we crossed the famous Reliance Industries Ltd and Essar oil Ltd. We stopped at motel on the way for some tea and snacks. We had our stay arrangements at Govardhan Greens. It’s a nice, tiny resort just at the outskirt of Dwarka. Dwarka is a relatively flat region at sea level, having an average elevation of 0 metres. It is one of the seven most ancient cities in the country. it is considered to be one of the holiest cities in Hinduism and one of the Char Dham along with Badrinath, Puri, Rameswaram. The city is especially respected by Vaishnavas. Adi Shankaracharya had visited Dvarakadisha Shrine and had established the Dwaraka Pitha. The others are at Shringeri, Puri and Jyotirmath. This legendary town is well-visited by religious travellers world-wide for its famous Jagatmandir temple that houses the Dwarkadhish (Lord Krishna) and dates back to 2500 years. The Lord here is dressed in Kalyana Kolam where he appears to be in a Royal Wedding costume. It is one of the 108 Divya desams. The present temple was built from 6th to 7th century, while the original temple was believed to have been built by Krishna’s great grandson, King Vajra. The 5-storied temple is made of limestone and sand. A flag is hoisted in the temple tower five times each day. There are two gateways – Swarga Dwar, where pilgrims enter, and Moksha Dwar, where pilgrims exit. From the temple one can view the Sangam (confluence) of River Gomati flowing towards the sea. The temple opens at 5 PM. So, we had some tea after checking in at the resort and then went to the temple. Cameras, phones are not allowed there and therefore we left our mobiles and cameras in the car. It’s a nice temple. We worshiped at the temple. There is divinity at the temple and one can feel the divine vibrations. We returned home in the night. Next day, we planned to visit Bet Dwarka. This is the place where Krishna used to reside and this is the place where Lord Krishna met his friend Sudama and blessed him, there is a Peetha (seat) where Lord Krishna met Sudama. The temple also has the main Dwarkadish deity which was believed to have been made by Krishna’s chief Queen Rukmini and in which Meera bai merged and disappeared from the material world. 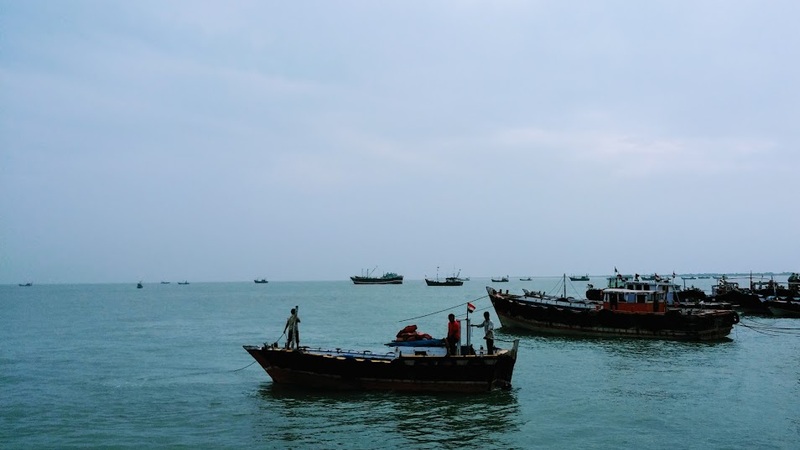 Bet Dwarka Island, also known as Bet Shankhodhara, is situated in the Gulf of Kutch. Early historic settlement remains have been located on the island which may be dated back to 3rd century BC on the basis of a potsherd inscribed with ‘Nandakasa’ in the Mauryan Brahmi script. 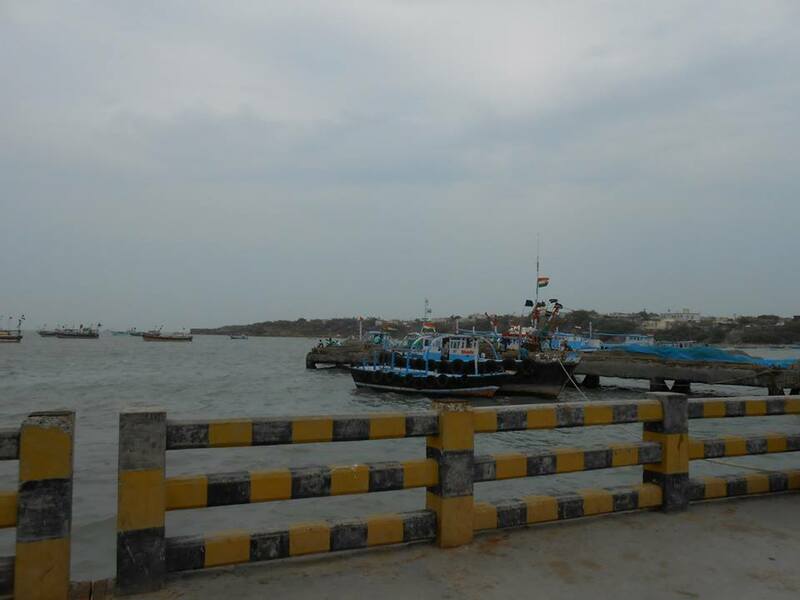 We drove to Okha jetty, which is around 30 km from Dwarka. There are boats available from Okha Jetty from where people are ferried to the Island. It was quite a sunny morning, but when we reached Okha, it was quite cloudy. We boarded a boat to reach Bet Dwarka. We then went to Dwarkadheesh temple after reaching the island. We then had bhog there in the temple premises. The temple and other coastal sites have ample antiquities, mainly potsherds, suggesting maritime trade and commerce with the Mediterranean countries around the Christian era. As we walked out of the temple, it started raining. We hired an autorickshaw to take us to Hanuman temple. This is the place where Hanuman fought with his son Makaradhwaja. We worshipped at the Makardhwaja temple and also were offered prasad. From here we rushed to the jetty as it was raining heavily then. On reaching the jetty, we found a boat ready to leave. We managed to get Jaya’s father inside the cabin. We were on the deck of the boat. As we returned to Okha jetty, we were completely drenched. I couldn’t do photography because of rain and the camera lens was very much fogged. We then went on to see Gopi Talav. This is the place where Lord Krishna used to play with his Gopikas. There is a small pond where it is said that Lord Krishna used to play with the Gopika Strees (Gopika Women). From here, we went to Shiva temple — Nageshwara Temple. It is enshrined by one of the 12 swayambhu jyothirlingas in the world, in an underground sanctum. A 25 m tall statue of a sitting Lord Shiva and a large garden with a pond are major attractions of this serene place. Some archaeological excavations claim five earlier cities at the site. We performed Rudrabhishek here. The Pouring of water on shivalinga is called “Abhishek”. The continuous water pouring on shivalinga with chant of great Vedic mantras is called “Rudrabhishek”. As per the temple rules here, a male Hindu can perform Rudrabhishek only wearing a dhoti. There is a change room next to the temple where many dhotis are kept. My father-in-law and I changed into dhotis for performing Rudhabhishek at the Shivalinga. We returned to Dwarka after visiting Rukmini temple. This temple is situated at 8 Kms from Dwarka. This is in the outskirts of the city and this is a lonely temple and there is an interesting story of Rukmini being cursed by sage Durvasa because of which the temple is situated outside the city and it’s because of this curse only that the water in Dwarka city is salty. We then visited Bhadkeshwar Mahadev Temple. It is set right in the middle of the Arabian sea near Dwarka. After praying at the temple, we sat for some time on the railing to enjoy the sea — Arabian Sea. We then returned back to our resort. Today we spent moving around completely drenched in rain. We relaxed in the resort in evening.